In previous Writings From a Past Life we’ve printed childhood works and then David has gone off on silly and pointless riffs which have proven funny only to himself. (His words.) This week is different. While doing research for an upcoming article, I got the chance to root around in the David Foster Wallace papers at the University of Texas’ Harry Ransom Center. I unearthed lots of neat (neat? Come on) things (things? Come on), but one piece in particular caught my eye–a childhood poem written by Wallace, presumably for a grade-school class. Pretty powerful stuff. On the whole, I prefer to let you, our devoted readers, draw your own conclusions–and share them below, of course–but I will take this opportunity to point out a few tidbits which I hope you’ll find as interesting as I do. First of all, the spelling errors are downright adorable. Just had to get that out of the way. Note Wallace’s uncommon phrasing in “so hard and for bread.” I can’t think of a single child who would opt for this phrasing over, say, a more simple “so hard to make bread.” One possible interpretation is that Wallace is using bread to mean money, but this seems unlikely. Another possibility is that Wallace, even at such a young age, was already exhibiting the masterful grasp of language for which he would later become famous. Also note Wallace’s atypical word choice. Not “when she’s done”; not “when she’s finished”; but “when she’s threw [through],” a nuanced construction more fitting for an adult than a child. This could very well be an indication that the young Wallace was attuned to the speech patterns of the people around him, namely his parents and teachers. His ear for spoken language and talent for mimicry would stay with him into adulthood, exemplified in the authenticity of his characters and the organic dialogue they exchange. Her first clue was in the poem’s final line: “she feels she’s dayd” which, in the context of a piece about the consequences of labor, calls to mind the expression “dead tired.” She surmises that Wallace may have heard his mother utter these words and appropriated the experience for his creative work. 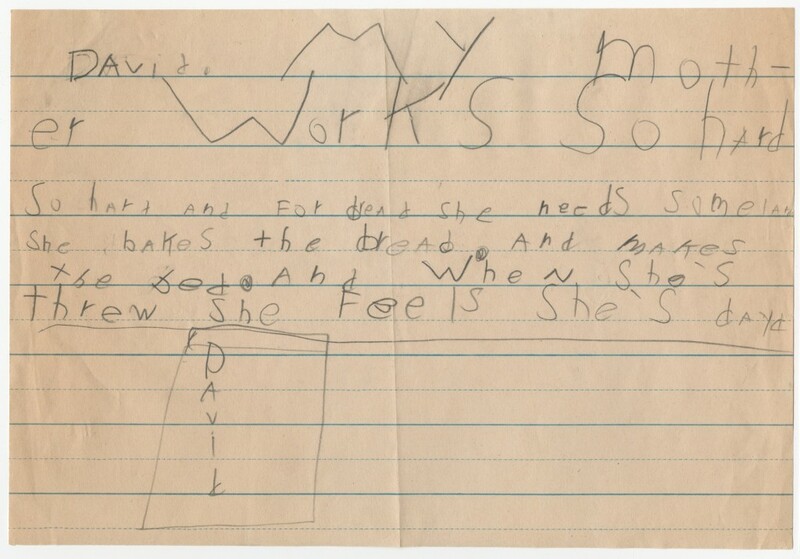 On the most superficial level, this poem is a commentary on his mother’s complaint. “On the surface it’s about his mother’s housework, but there’s more to it than that,” Mrs. G tells me. She goes on to explain that, from a psychoanalytic perspective, this poem smacks of loneliness. In third person narration, Wallace observes his mother attending to her work, and wonders if she has energy enough to attend to him; he observes his mother in a state of physical exhaustion, and wonders if her capacity for affection has been exhausted as well. After all the housework–making the bed and baking the bread–will she have anything left for him? If this is the case, consider the symbolic implications of dead: separate, detached, absent, unavailable. In the simplest terms, feeling dead means not feeling alive. Wallace’s mother feels she’s dead. Does Wallace agree? Honestly, the first line as title never occurred to me, but I think it’s a valid point. In this case, Wallace is employing a pretty advanced poetic device in linking the title to the poem’s body, ie. “so hard and for bread” is a continuation of the title rather than a stand-alone line. I buy it. As for his age, the folder in which I found this piece was labeled, “Early Schoolwork, 1971-77, undated, very early DFW,” which would make him 9 at the youngest. Mrs. G, however, placed him at age 7. Thanks for the additional info. This has been very interesting. Thanks also for posting it. My mother works so hard, so hard and for bread. She needs some lard. Is he not just using the blue-lined ruling like one does in school at that age to practice penmanship? Maybe on the next line he realizes he doesn’t need to follow the ruling because this is personal and not classwork. Do you think it’s personal work? Would he have used composition paper at home? (Maybe that question is ridiculous. If composition paper was handy, he would have used it, right?) Would he have written his name at the top of the page if it weren’t for school? This is really amazing. It makes me want to go through my old papers from childhood. I wish you had done that a few weeks ago! This post marks the close of our Writings From a Past Life series. Still, if you come across a treasure, we might just post it as a throwback. Nice one; love the enormous lines on this grade-school paper, too. This entry reminds me of one of my favorite blogs, Letters of Note (http://www.lettersofnote.com). I’m surprised they don’t have any DFW there, actually, since they have several repeats from other larger-than-life writers (notably, Hunter S. Thompson). Maybe you should hit them up with this find! I’m also into the composition paper. Brings me right back to second grade, practicing cursive until I thought my little hand would fall off. Remember cursive? Have you ever in your life used cursive? After second grade, I mean. I know you’re supposed to sign your name to paychecks in cursive. So no, I haven’t used cursive since second grade. And yes, I was drawing a paycheck in second grade. Oddly enough, I was one of those little freaks who wrote TONS of handwritten letters to pen-pals, back in the day. So I was cursive all the way on that (until my handwriting got super illegible). I also recall a junior high-school librarian yelling at us all that our penmanship was “atrocious!” and he may or may not have forced us all to practice our cursive. In 8th grade. Maybe this also explains why I am drawn to cursive-looking fonts? I can’t tell if there is a period in that first sentence. I can’t tell either. The line break seems to suggest our reading, but could very easily be circumstantial. His periods are both prominent and inconsistent, which complicates interpretation. In your reading, I do like the idea that he chose to repeat “so hard” purely for emphasis. An intelligent decision, for sure. also, in thinking about it (perhaps overthinking), the vertical David at the end is sort of a strange premonition… I imagine that people choose methods of suicide in a deliberate, not arbitrary, way — his mother left him hanging? This poem happens to have been written by someone about whose later writing we know quite a bit so it’s interesting to collectively compare notes on what seeds may have been present of what would come later. If you looked at a poem your friend wrote when they were seven you would likely see early expressions of their current day character. Strangers just wouldn’t be able to add to the discussion. The notion that the vertical signature predicts his suicide, I do agree, is a bit much. I chalk it up to formal exploration.